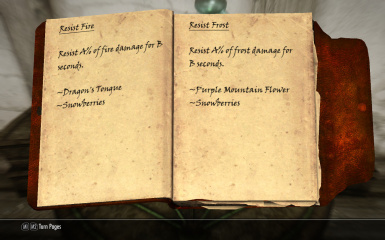 This is a journal that will contain information about all investigated effects of ingredients and will be updated as you progress in alchemy. -added optional requirement for inkwell and quill. -fixed capital letter in the name. This is a journal that will contain information about all investigated effects of ingredients and will be updated as you progress in alchemy. It can't be used as a cheat, because it contains only known effects. I created this mod for two reasons. 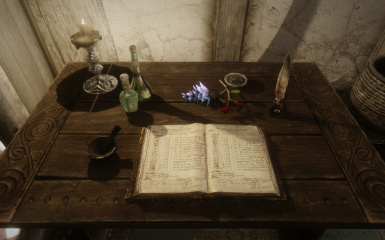 Firstly alchemy UI shows only those effects for which you have ingredients, and if you already crafted some potion before but you don't have any ingredient for it now, then you have to rely on your memory or use paper to record your investigations. 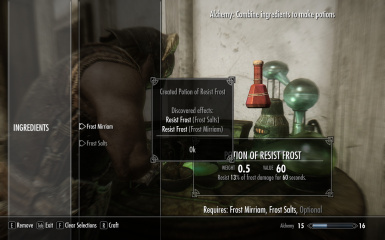 Secondly if you don't have portable alchemy laboratory, then you can't to look which ingredients are required for potion of cold resist, when you met too strong frost atronach in a dungeon, and you wanted to look for ingredients on the way back to the city. Can be crafted at the forge or at the tanning rack (depends on selected options during installation). 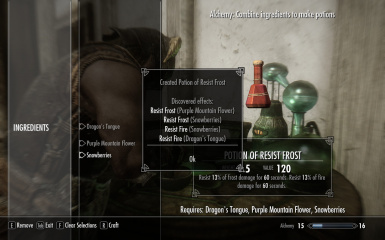 Should be compatible with everything: with custom ingredients/effects, with mods like "Learn Alchemy From Recipes" (it doesn't matter how you will learn effects). May conflict only with mods, which hooks the same function, but I don't know such mods. added optional requirement for inkwell and quill.